EUCLID, an international intergovernmental institution with a university mandate, offers to select students from the general public its flagship program which is an online master in diplomacy and international affairs (MDIA). It is the only Master's degree program in diplomacy organized by an international intergovernmental organization and officially used by active diplomats over 4 continents, counting among its students and alumni officials at the minister, ambassador and diplomatic counsellor levels. 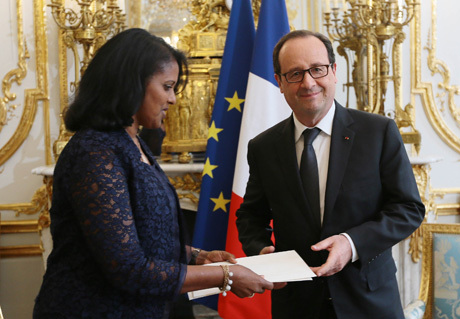 Photo: EUCLID MDIA graduate Ambassador Hanna Simon presenting her letters of credence to President Francois Hollande of France. 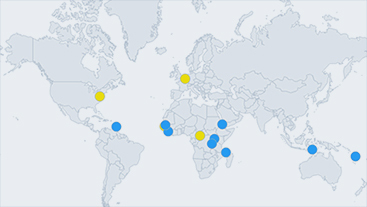 The EUCLID MDIA is an advanced program delivered by a treaty-based and treaty-practicing institution, and as stated by the United Nations in a rare instance of explicit confirmation, "the UN Secretariat recognize Euclide- Pole Universitaire Euclide and the other four UN institutions ... as being accredited." Note: For information about our Online Master Degree in International Public Health (EUCLID MIPH), please visit this page. Note: For information about our Online Master Degree in Sustainable Development and Diplomacy (EUCLID MSDD), please visit this page. Note: For information about our Online MBA in International Organizations (EUCLID MBA IO), please visit this page. 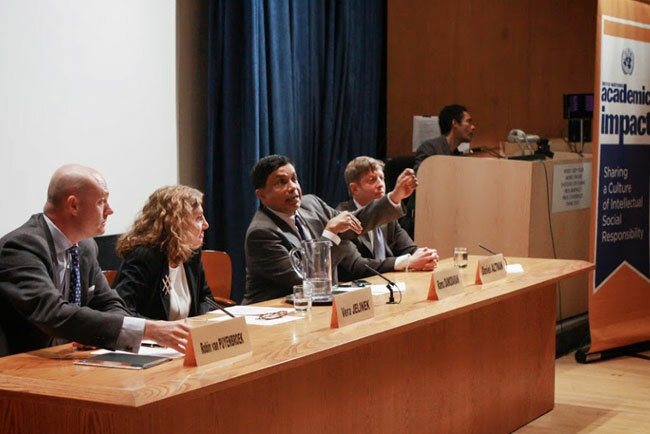 This unique Master's degree focuses on diplomatic practice and the actual application of theoretical knowledge, rather than the advancement of academic knowledge for its own sake. Also, international relations are examined from the contrasting perspectives of various actors including developing countries. Thanks to its low tuition and remarkable institutional relationships, it is of special interest to European and African students. What is Diplomacy? Why does it fail? Applicants must have a Bachelor’s degree or its international equivalent, issued by an institution listed in the latest edition of the UNESCO-IAU handbook or a similar official directory. 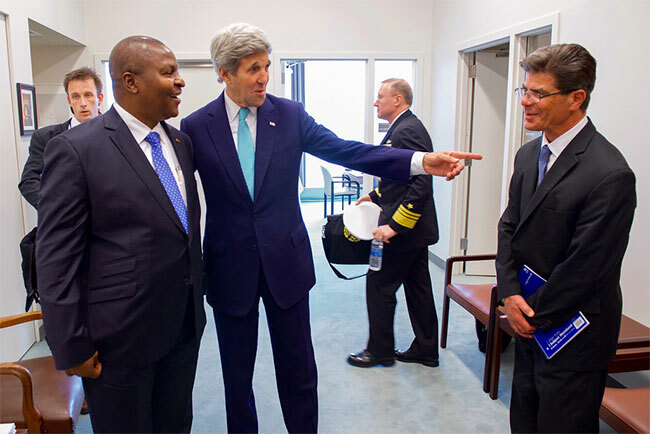 Photo above: EUCLID's High Steward Pr Faustin Touadéra with US Secretary of State John Kerry. Full caption: "U.S. Secretary of State John Kerry, who speaks fluent French, points to his French interpreter on standby as he meets with CAR President Faustin-Archange Touadéra after both officials signed the COP21 Climate Change Agreement on Earth Day, April 22, 2016, at the United Nations Headquarters in New York, N.Y. [State Department photo/ Public Domain] [State Department photo/ Public Domain]"
Photo above: EUCLID's Robin van Puyenbroeck, panel speaker at the Eurozone in Crisis event at the United Nations Dag Hammarskjöld Auditorium, May 2013.